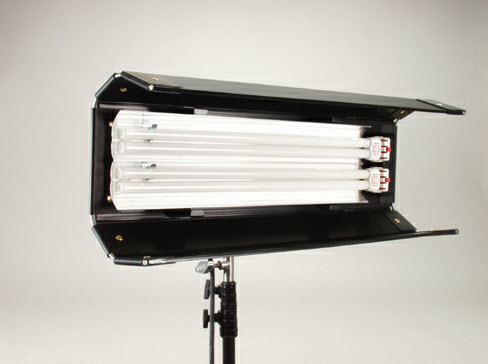 Soft light perfect for Television or Film documentary shoot style. Compact size is ideal for travel. Most effective in close proximity to the subject. Light is easily controlled with built-in barndoors and detachable louvers. Daylight balanced (KF55) and/or tungsten balanced (choice of KF29 or KF32) lamps. Light level control managed by on board dimmer as well as by 2 and 4 lamp switching.